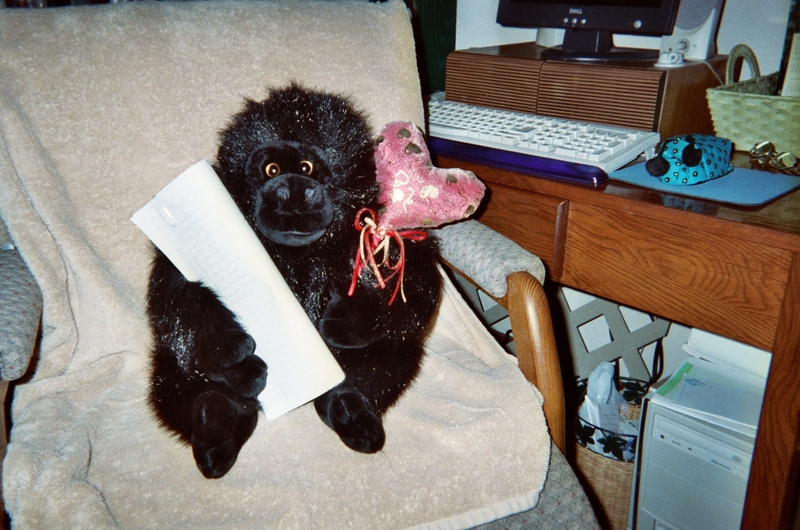 Home » Posts » Attentionology for K-5 Teachers » Get Your Class to Go Ape Over Homework! Still, as you may have guessed from your own teaching experience, when I get to class any morning after I make a homework assignment, there are often a few students who haven’t gotten it done or who’ve left the homework at home. Please give your homework to Harry! You’ll need to decide how age-appropriate the use of a stuffed animal is as a teaching tool in your class. I’ve seen especially good results, meaning a good response from my students, when I’ve used stuffed animals in grades K – 3. As icons for something as specific as homework though, like Happy Harry – The Homework Gorilla, a stuffed animal may also be effective in grades 4 and 5. I suggest placing Harry by your classroom door, seated with a box next to him where students drop in their homework. Simple, but very effective because you have taken a lovable, furry, funny stuffed animal and CHARACTERIZED IT TO MEET A SPECIFIC TEACHING GOAL…getting your class to go ape over homework! Keep in mind that you can characterize and/or personify anything. Wow! The opportunity to catch and keep K – 5 students’ attention using the trick of bringing life-like (like Happy Harry – The Homework Gorilla) or inanimate objects to life is amazing. IDENTIFY YOUR PURPOSE – What is the specific goal of the characterization? Motivating students to get homework done is clearly the identified purpose of the gorilla detailed in this blog – Happy Harry (playing on the word hairy, as in hairy ape). INTRODUCE THE CHARACTER – I suggest creating some buzz about your character by building anticipation about it in class before your introduce the character to students. For example, the day before I first brought Happy Harry – The Homework Gorilla to class I told my students that I thought that some of them needed extra help remembering to get homework done and delivered. When I lifted Harry out of hiding in his homework box, the class hooted, much like an excited gorilla in real life! Science – Hold Harry in your hands and tell the class that he’s worried because his extended family is shrinking due to a loss of (vocabulary word – habitat). Go on to explain what that means, perhaps with a book of information about animals in natural places. Music– Sit Harry on a flat surface in front of the class and lean a sign on him that says, Harry Loves Music, Too, meaning “in addition to homework.” Explain to your class that gorillas make many sounds. They grunt, roar, growl, whine, chuckle and hoot. Invite students to join Harry in making a special kind of music with gorilla-like sounds. Lead your class by making Harry appear to bounce in his seat as you and the class imitate gorilla sounds. Your kids will love Harry’s music! Sign Language– You may have students with deafness who will enjoy learning that gorillas are very smart and can learn complex tasks like sign language. Hold Harry in your lap and move his hands as if he’s using sign language. Then demonstrate the sign language with your own hands and ask the students to repeat the signs. This activity can be successfully used in any elementary classroom to introduce sign language and develop sensitivity to students with special needs. 4. INNOVATE WITH USES OF CHARACTERIZATION – Once you’ve selected a life-like or inanimate object to bring to life as a teaching tool for a specific goal, ask yourself what other ways you can use it to catch and keep K – 5 students’ attention. After I introduced Happy Harry – The Homework Gorilla to kids, I announced that Harry wasn’t in class only to collect homework in his box; he had something to give to students…little homework reminder notes (in a separate small box) for kids to take if they needed one at the end of the school day. Using characterization and personification (look for more about this in future blogs) to catch and keep kids’ attention is a great way to develop your creative skills as a teacher. That brings us to I-number five…”I can make it happen.” Yes you can. 3 Pings/Trackbacks for "Get Your Class to Go Ape Over Homework!" I have recently started a site, the info you provide on this web site has helped me tremendously. Thank you for all of your time & work….